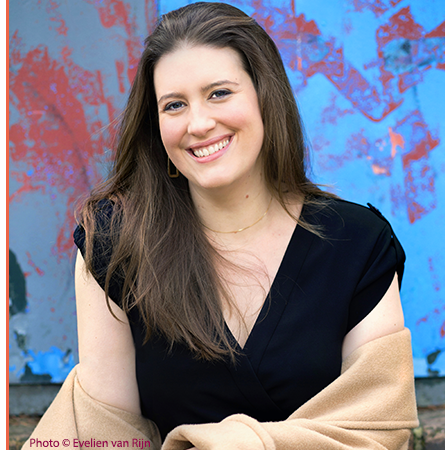 Dutch-American soprano Katharine Dain maintains an active and growing performance calendar in Europe and North America. Katharine is becoming known for unusual musical imagination, intelligence, and fearlessness, qualities which serve well in chamber music and orchestral settings, experimental multidisciplinary and theatrical projects, and–notably in recent seasons–jump-ins for high-profile performances of obscure repertoire. After taking the top prize in the 2017 Clermont-Ferrand International Vocal Competition, Katharine made her role debut as Konstanze in a 2018 production of Mozart Die Entführung aus dem Serail (touring to the opera houses of Clermont-Ferrand, Avignon, Rouen, Massy, and Reims) to great acclaim: “coloratura of ideal precision and phrasing like a dream, in an unending crescendo of inspiration ... her tragic arias were the highlight of the evening” (Opera Online). In the 2018-19 season, she will make role debuts as Cunégonde (Banff Centre) and Donna Anna (Armel Opera Festival), among other projects. She stepped out as soprano soloist in Luigi Nono’s oratorio Il Canto Sospeso at the Holland Festival under Ingo Metzmacher, which led to an invitation from the Teatro Comunale di Bologna to perform the same piece under Roberto Abbado. She has also been called in at the last minute for performances at Ireland’s West Cork Chamber Music Festival (“singing as though the music had been written just for her,” said the Irish Times), a solo recital of Strauss, Marx, and Korngold lieder in the Concertgebouw Kleine Zaal (called “a miracle” by Place de l’Opera), Carmina Burana at the Concertgebouw’s Robeco Summer Nights series, and for the world premiere of an oratorio by Dutch composer Jan van de Putte with Asko|Schönberg and Cappella Amsterdam under Reinbert de Leeuw - a performance that was broadcast live on Dutch Radio 4 from the Concertgebouw’s Zaterdagmatinee series and later released commercially on Etcetera Records. A passionate promoter of chamber music and recital repertoire, she has co-founded several chamber groups including, most recently, Damask Vocal Quartet. Favorite collaborators include the Quiroga and Ragazze Quartets, the new-music-focused Oerknal!, Nieuw Ensemble, and Ludwig chamber orchestra, the experimental theater company Silbersee, and pianists Julius Drake, Reinild Mees, Sam Armstrong, Tom Poster, and Renate Rohlfing. Educated at Harvard University, Guildhall School of Music and Drama, and Mannes College of Music, Katharine currently lives in Rotterdam.